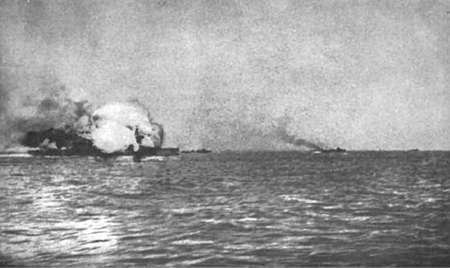 Photo showing the flames shooting out of Invincible's midship and foremost turrets. Taken under battle conditions by an officer from a destroyer at the very moment she commenced to blow up. "About 6.15 I noticed the Invincible and the two other battle cruisers appear out of the mist, which was thick on the disengaged side though farily clear to the wouthward, and swing magnificently into line ahead of the Lion, opening fire as they did so. Shortly afterwards the Defence, Warrior, Black Prince, and one other cruiser also appeared suddenly out of the mist, and cut across the Lion's bow; a few minutes later the Defence blew up and the others were put out of action, though I did not see exactly what happened to them. Hardly had we recovered from the shock of this disaster - it lasted only three or four minutes - when the main Grand Fleet, with destroyers and light cruisers leading them, bore down upon us like an avalanche from out of the mist on the disengaged side. We put our helm hard over to avoid collision, and just managed to squeeze through the gap by closing with the Lion. As the Grand Fleet deployed into line to the north-east or east-north-east, we received a signal from the Lion: "Pick up survivors from wreck on starboard side" where we could see what appeared to be the bow and stern of a light cruiser sticking up out of the water. Assuming this to be a German wreck and that we should have prisoners to pick up, I sent to have an armed guard detailed and warned our doctor to be ready to tend wounded prisoners. A few minutes later I received exactly similar orders from the Captain. In the meantime, we had cut through a gap between the battle cruisers, and were heading towards the wreck in "No Man's Land" between the two fleets. As we neared the wreck, we could see the water all round thick with flotsam and jetsam, mainly composed of floating seamen's kit bags, with a few hammocks scattered among them. We also spotted a raft on which there were four men, and on the bridge they spotted two other survivors in the water. By orders from the Captain, I lowered and sent away the whaler with our gunner in charge armed with a service revolver. The Captain brought the ship alongside the raft, and I waited with the doctor and the armed guard to receive German survivors. Judge of my surprise, when the raft was almost alongside, to see a Commander RN, a Lieutenant RN and two seamen ratings on it. In my surprise I forgot to dismiss the armed guard, who, no doubt considering that it was that for which they were there, wanted to seize on the unfortunate survivors as we hauled them on board. However I quickly sent the guard away and apologised to the Commander who treated it as a good joke. It was a great shock to us when he made us understand that the wreck we were near was the remains of the battle cruiser Invincible, and that we were picking up the only survivors of her ship's company of over a thousand men. We steamed slowly round the wreckage to make sure there were no more survivors then rang down full speed and made off to join our flotilla with the Lion." *The survivors were Commander H. E. Dannreuther, Lieutenant C. S. Sandford, C.P.O. Thompson and two ratings and a Royal Marine private, most of whom had been in the control top. They were picked up by the Badger, of the 1st Flotilla. "HMS Invincible had been hit amidships and cut by the explosion into two nearly equal halves, the central ends of which seem to have been resting on the bottom. The depth of water was about 25 to 30 fathoms - i.e. 150 to 180 feet. As HMS Invincible was 500 feet long, there was therefore some 100 feet or so of each end of the ship which could show above water."